BioSignals ist eine Reihe ortsspezifischer Klangkunst, Erzählungen und naturbasierter Datenströme von menschlichen und nichtmenschlichen Kreateuren im Sommer und Herbst 2018, ergänzt durch einen Beitrag beim nächsten Pixelache-Festival in Helsinki im Frühjahr 2019. Das Projekt konzentriert sich auf kreative und tatsächliche Interpretationen von Biosemiotik, bei denen Energie als Medium und Kommunikation verstanden wird. Knstler/innen: Sarah Hermanutz und Nenad Popov, Andrew Gryf Paterson, Pedro Soler Antye Greie-Ripatti, Juan Duarte, Krisjanis Rijnieks, Krista Dintere, Laura Beloff, Lilli Tölp und Mikko Lipiäinen. 14.00 Uhr Die Kuratoren von BioSignals, Andrew Gryf Paterson und Mikko Lipiäinen, präsentieren der Öffentlichkeit die Ergebnisse von BioSignals und Ergebnisse früherer Treffen. 2. Lilli Tölp - Toortuumik Natur- und Medienkunstfestival 2018. 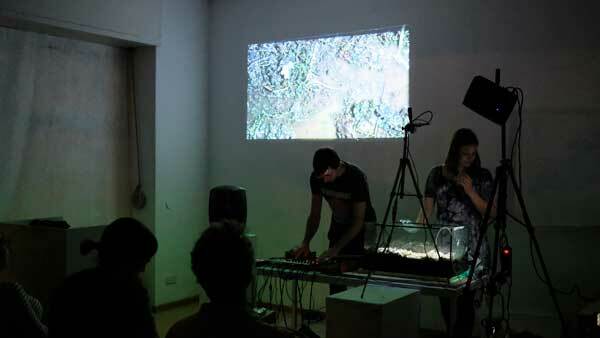 20.00 Performance: Live Decomposition vonSarah Hermanutz und Nenad Popov. Hermanutz und Popov haben in ihrem Projekt Live Decomposition, 2017-18, bereits im vergangenen Jahr in Lissabon und Berlin zusammen gearbeitet. Ein Video dokumentiert Hermanutzs Hände, während sie durch ein Aquarium arbeiten, das mit Schlamm, Sand, lebenden und toten Feuchtgebieten und anderem gesammelten Material gefüllt ist und die (Un-) Möglichkeit von Miniaturökosystemen darstellt, die von den menschlichen Händen kontrolliert werden. Eine Schichtung von lebendigem, nicht lebendigem, natürlichem und menschlichem durchdringt die Performance, während Popov mit Sound Material arbeitet, durch Hydrophone im Aquarium aufgenommen und durch Synthesizer nachgearbeitet. A sound device that enables an experience of Augmented Listening of wind forces, in which subtle changes in an outdoor environment drive generative soundscapes. The use of wind-sensitive systems, are used to detect orientation and speed of the wind, and acoustic events, that are registered and processed as a generative sound piece by a network of sensor networks. The work takes as a reference an ancient instrument that is known as the Aeolian Harp (cf. Kircher, A ca 1650. ), that was used as an object that enabled holy spaces, such as mountains and temples, to "speak" with human beings, according to a mechanism that self-played through strings and resonators by the aleatoric forces of wind. 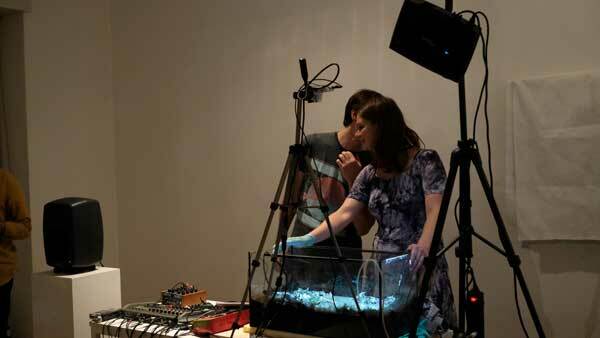 For this presentation of Bio Signals, an ongoing documentation that registers the interventions produced with the device and field recordings to review the outcome from experiments between soundscapes, radio signals, and live sonification of sonic events. Locations of recordings include Virtsu - Estonia, and Soca - Slovenia, between June to August 2018. Juan Duarte Regino, Mexico City (1985), media artist statement: I work on interactions as a tool for generative art experiments . The exploration of digital and analog platforms as agents to transform that express sonically and visually materials. Meanwhile, a hybrid engagement between environment, users with artefacts and interfaces can work to explore new realities. The exploration of sonic experiences put in public space may bring an opportunity for a ludic and cultural approach on technological exploration. My work has been presented in CTM Festival 2015, Spiral Gallery,, AAVE Festival, Bonniers Konsthall, Rundum Showcase, ICLI 2014 , Ljudmila, Radio and TV Museum of Lahti, Centre for Contemporary Art - Ujazdowski Castle, Mänttä Art Festival. Since 2014 I am part of Pixelache - art and activist group based in Helsinki. Bringing media art practices for social engagement, and technological appropriation. The Hearing Test is a part of a Longer artistic research project that investigates plant intelligence. The Hearing Test ironically asks: will humans ever be able of a reciprocal communication with another species, or even capable of 'hearing' another species that differs from us - such as a plant. In the focus of the project is a detection of high frequency clicking sounds emitted by the plants' roots. The project has been inspired by scientists who have been researching acoustic emissions in plants and their possible meaning and use as a communication by plants. 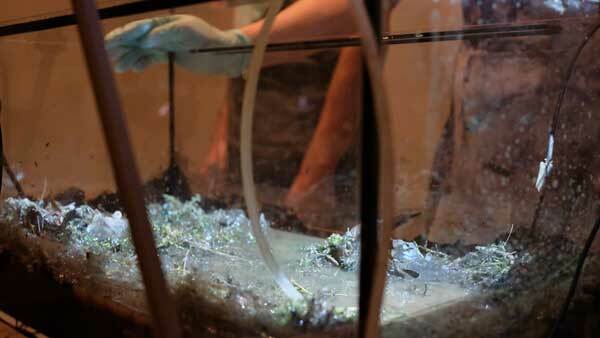 They claim that plant roots produce high frequency clicks between 20 and 300 kHz by bursting of air bubbles. This can be compared to the general hearing range of young humans that is between 20 Hz and 20 kHz. In my experiment the clicks are detected in real time with contact microphones that are carefully attached to the roots of the plant. The clicks are further down-sampled to a human hearing range. However this does not mean that the plant will produce clicks on demand. Laura Beloff (FIN/DNK) (PhD) is an internationally acclaimed artist and a researcher. Her artistic research is located in the cross section of art, technology, and science. The recent investigations and art projects are focused on the merger of the technological and biological matter and intelligence. Currently she is Associate Professor and Head of the PhD-school at IT University in Copenhagen. In early June, Finnish artist-researcher Laura Beloff, associate professor at IT University in Copenhagen was invited to join the Toortuumik nature and media art festival initiated by Lilli Tölp (Maalabor ) for a short week long residency to continue her bioacoustic experiments. As one of the participants with the most knowledge about biosemiotics in the group, she accompanied Andrew Paterson to Puhtu peninsula nearby for a key interview in the BioSignals project telling about her inspiration from biosemiotics in her projects. Martinka Bobrikova & Oscar de Carmen have been working together since 2005. Their practice, which is often community based, aims at setting up new social ecosystems. By revolving around the mechanisms and context by which power creates systems of value, they seek to intervene on the border between art and current topics of contemporary life in order to bring about the proposition of the transitory and the utopian. Afterlife is the last installation that Bobrikova & Carmen did with the organic batteries. Afterlife, proof of life after death and other related critical concepts, such as the purpose of life and reincarnation of overproduction of food from supermarkets. The project offers the possibility to use expired food in energy production. As part of our process, we developed a pilot project where we observed that fruits and vegetables produce small amounts of electricity through an electrochemical reaction. This was achieved by inserting two different types of metal, copper and zinc, in each of the fruits in the installation. These fruits produce small amounts of electricity when they are connected in series and operate a small screen. From this moment our focus was aimed at finding ways of putting conservation of energy into practice; this is first law of thermodynamics, which states that energy can not be created or destroyed, only transferred from one form to another. Thus, our installation is also a way to visualize an analogue synthesis, where energy is transferred from fruit and vegetables to small plasma screen, creating a symbiosis. The installation is conceived as a social critique of the existing consumer society and a proposal for an alternative and further use of fruit and vegetables, which are regarded as superfluous and unsellable by supermarket chains. Exhibited at Carl Berner Projektrom in December 2015. Krista Dintere - "This is my contribution to Swamp Radio project - a collaborative sound composition exploring the relations between factuality of field recording and the fictional soundscape created by transmitting recordings through the circuitry of modular synthesizer. Collaborators from MpLab (Art Research Lab at Liepaja University) are: Krista Dintere, Ieva Viksne, Diana Mikanova, Paula Ostupe, Kaspars Levalds. Created for Swamp Radio in 2018." The Swamp Radio project is based on earlier Biotricity experiments by artists Rasa Smite and Raitis Smits at RIXC and Kemeri bog near Riga, Latvia. Biotricity sonifies and visualizes the fluctuation of bacterial electricity generation, and artistically interprets collected data from the environmental monitoring. 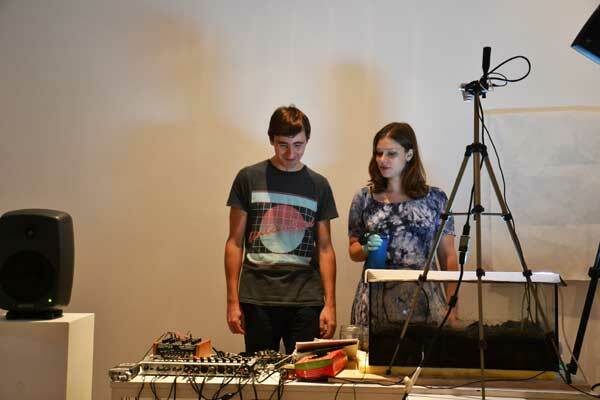 This spring 2018 the artists expanded their Biotricity research into water reservoirs and marshlands in the Boston area, and creating the Swamp Radio monitoring and transmitting environment for the wetlands of Venice. New media technologies are dependent on energy and material resources. Especially for mobile and handheld devices, batteries today constitute the primary backbone of portable energy storage and supply. Despite over decades of research, they remain assemblages of messy chemicals, hazardous, black-boxed and subject to thermal runaways. This talk excavates the battery as a key component of media technologies, that not by itself can be considered media for dataflows, but without which media cannot operate nor exist. How is the batterys obsolescence tied to modern media and its throwaway origins? Why and how hardware design came to conceal it and how software today merely provides a surface tweak? From mining to manufacturing to toxic landfills, what are the materialities of the batterys contemporary life-cycle in the so-called circular economy? By a thorough excavation, Samir Bhowmik contends that a historical and technological understanding of portable energy storage is critical to shaping an environmentally-ethical future of new media. Bhowmik also presents the Community Power Bank (CPB) workshops at Pixelache Helsinki in 201516.The project recycled Lithium 18650 batteries with community participation and re- purposed them to build power banks for handheld media devices. The workshops were conducted at the Museum of Photography and at the OSCE (Open Source Circular Economy) Days in Helsinki, Finland. The presentation was recorded at KuusiPaala project space in Helsinki, 18th May 2018. Samir Bhowmik (b. 1975) is an artist, architect and researcher. He is currently engaged in art installations in Helsinki and Berlin along with post-doctoral research at the Institute for Musicology and Media Studies, Humboldt University-Berlin. Samir graduated as a Doctor of Arts in New Media from the Media Lab of Aalto University, Finland. His artistic and research practice focuses on media infrastructures, ecological media and digital memory. He is supported by the Finnish Cultural Foundation since 2017. Photos by Art Laboratory Berlin, unless otherwise noted. The BioSignals process is supported by Nordisk Kultur Kontakt Culture and Art programme.